VA is excited to announce that service members and Veterans can connect to the Veterans Crisis Line using these simple words. 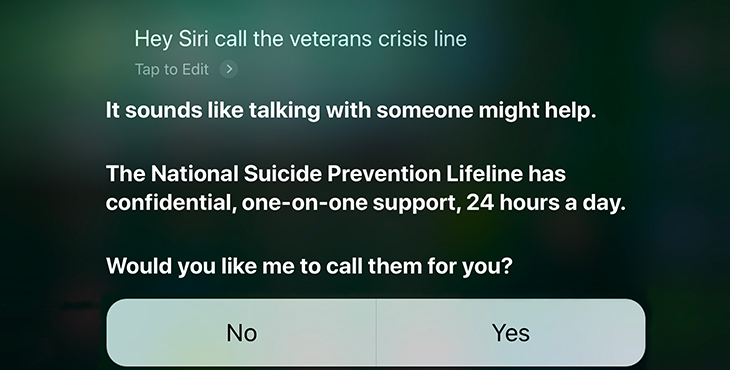 The Siri function on Apple’s iPhone and the Google Assistant function on Android phones now automatically dial the National Suicide Prevention Lifeline which also serves the Veterans Crisis Line, even if the number (1-800-273-8255) is not saved in the phone’s contact list. Callers will need to Press 1 in order to reach the Veterans Crisis Line. Responders at the Veterans Crisis Line are specially trained and experienced in helping Veterans when mental health or related issues — such as chronic pain, anxiety, depression, sleeplessness, anger, and homelessness — reach a crisis point. According to Miller, the ease of connecting to the Veterans Crisis Line is the technology’s biggest benefit. While recognizing the need for crisis access and rapid care, VA continues to build and emphasize sustained access to care for Veterans to receive ongoing treatment as appropriate. VA is leveraging a public health approach to suicide prevention that addresses multiple risk factors for suicide to stage interventions before suicidal thoughts and behaviors occur. While VA has made great strides in crisis intervention, the public health approach uses the best evidence available to guide the development of innovative new strategies to serve all Veterans. No one organization can tackle suicide prevention alone. To save lives, VA is using prevention strategies that reach beyond health care settings to involve peers, family members, and community members in order to reach Veterans where they are. If you or someone you know is in crisis, support is available 24/7. The National Suicide Prevention Lifeline is available to all at 1-800-273-8255. Veterans, service members, and their families and friends can call the Veterans and Military Crisis Line at 1-800-273-8255 and Press 1, chat online at VeteransCrisisLine.net/Chat, or text to 838255. About the author: Megan McCarthy, Ph.D., is the deputy director for suicide prevention for VA’s Office of Mental Health and Suicide Prevention. OMG it rocks, can I help? We should use technology to help save lives. We also need to have peer support weaved into transition. Right now, the VA allows current military veterans transitioning out of service to use the healthcare system for 5 years after discharge. It should be easy to have veterans healthcare records electronically sent to VA. Veterans need to have a mentor support system and partial plan for his or her cuter after service. I wish I could share these articles on social media. Is there a way? I think it’s a nice way to help all these VA who served their country and get traumatized. We can’t forget what they’ve done for America, or others. I am asst. mgr. in a Veterans home. Put this number in my phone for our residents–and myself. Service-connected Disabled. I’m 100% Service Connected look for a home! Great move! I support it! My questions: Do the aps track and report, or have the ability to track and report the action? Are the requests made to the aps stored and obtainable? Have precautions been taken to protect our privacy? Suicide prevention is one of our highest goals in supporting our brothers and sisters who have served honorably, as well as all people within reach. That being stated, there is a negative stigma applied to people, especially veterans, who reach out for help. We are often feared for our capabilities and actions which we’ve performed in the line of duty, and often deemed unstable or disturbed which leads to other unfavorable actions against us. Are we sacrificing our privacy for convenience and what cost must we endure to get help? This is very valuable resource for veterans. the easier it is to call the more likely veterans will use the service. This is a great step toward helping disturbed veterans get immediate access to the suicide line. Data and device security should be a consideration though.